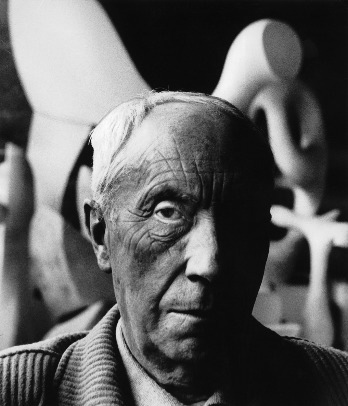 Jean Arp (1887-1966) was a painter, a sculptor and a poet. 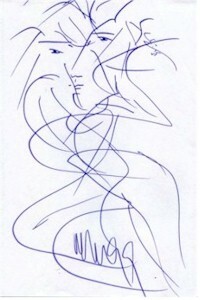 He was a prominent experimentor of automatic drawing and developed this technique to create his sculptures. Beginning in 1917, Arp's work shifted away from geometric forms toward a more fluid, organic style. During a trip to a Swiss lake resort, Arp was inspired to evoke the branches, stones, roots, and grasses he observed, working with brush and ink. He soon began using similar shapes in his drawings, creating free flowing forms that suggest the absence of deliberate consciousness or inhibition. Automatic drawing was developed by the surrealists, as a means of expressing the subconscious. In automatic drawing, the hand is allowed to move 'randomly' across the paper. In applying chance and accident to mark-making, drawing is to a large extent freed of rational control. Hence the drawing produced may be attibuted in part to the subconscious and may reveal something of the psyche, which would otherwise be repressed. We speak of surrealist automatism in that case. But if and when external suggestions made to the brain are responsible for the drawn expression then we'd speak of mediumistic automatism. 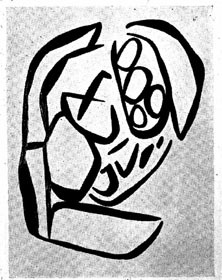 In 1915, Arp exhibited his first abstracts in Zurich and joined the Zurich DADA group. His uniquely personal type of abstract compositions with oviform or curvilinear shapes are lying borders constructivism and surrealism. Arp also began his experiments with automatic composition with random and chance elements and collectivism. In 1925 also he participated in the first Surrealist exhibition and became a member of the Surrealist group in Paris. Arp had several important exhibitions in New York, where in 1948 he published 'On my Way Poetry' and 'Essays I912-47'. He visited the U.S.A. in 1949 and 1950.